Like the old married couple we are me and The Boy went on a date night last week. We headed over to Neon Cactus and Calls Landing for a few drinks before descending on Red’s for some meaty good times. It’s a no booking kinda place but they let us put our name down for a table whilst we went away for a few drinks. Anyway after a beer and a glass of fizz we headed back to Red’s. We were seated straight away even though we were a tad early. The place was buzzy with people, a constant stream coming through the whole time we were there. The décor is cute and really open plan, big wooden tables, booths and a completely exposed kitchen. 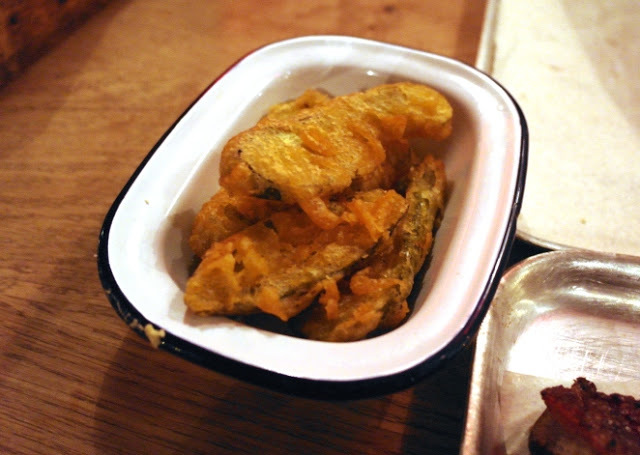 It feels a bit polished for somewhere that’s so newly opened (a bit if Jamie Oliver did the dirty south) but it beats anywhere that feels like you’re sitting in the food court of a service station (yup, talking about you Rib Shakk). 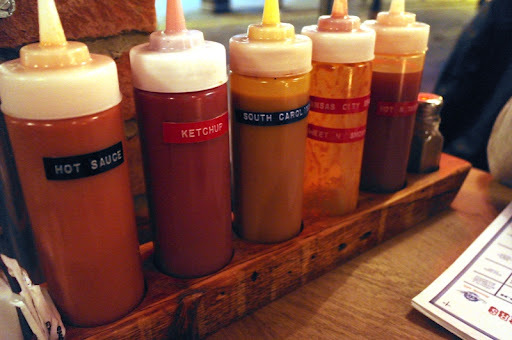 Though there are a lot of nice touches like all the different sauces on the table, everything’s served on tin plates and trays, boards that let you know what’s sold out and running low, plus they played some truly fabulous rock n roll while we were there. P stuck to the beer when we were there, I dug straight into the cocktails! I started with a hickory smoked daiquiri which was poured (complete which smoke) at the table. Utterly delicious, please try. 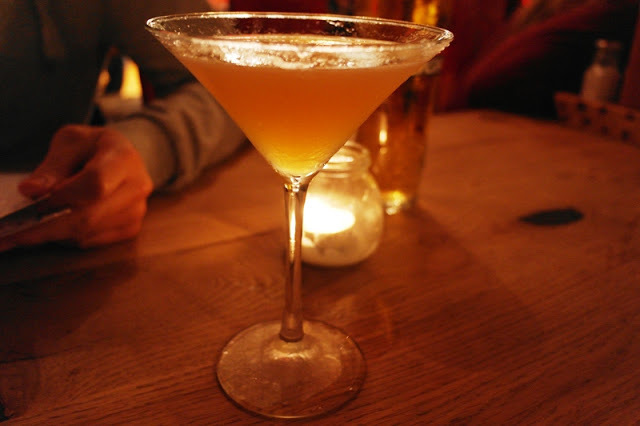 I then had an apple and elderflower martini at the end of the meal. Probably a mistake with all the food we’d ploughed through, I could barely manage a sip, a tad too boozy for me too. 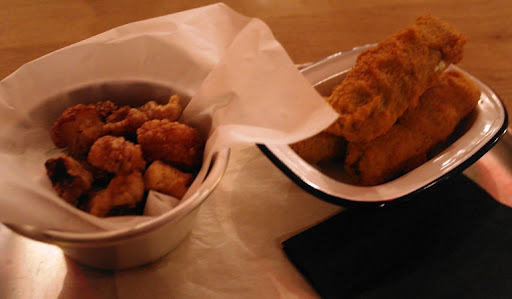 We shared pork crackling (me and P have a fetish for scratchings) and the jalapeno poppers. The crackling was probably the best I’ve had, obviously home made and delicately, subtly spiced. Jalapeno poppers are my dirty secret, I’m obsessed with them. Red’s manned up. Huge fresh jalapeno peppers stuffed to the brim with cream cheese. Impossible to eat without squirting everywhere (ensure innuendos). I loved them but P wanted more spice. 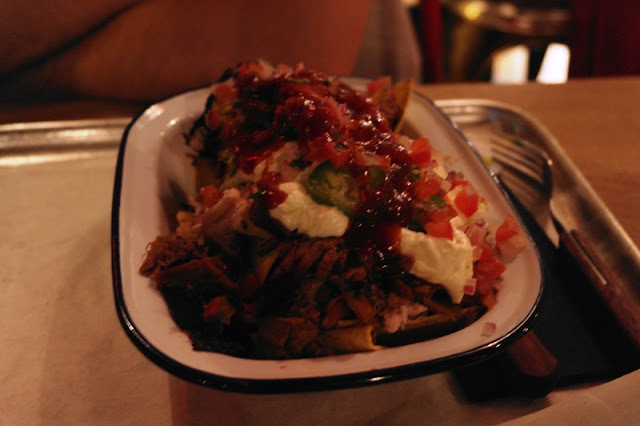 P went for the Pulled Meat Nacho’s (pulled chicken, pulled pork and beef brisket) which was literally dripping with toppings and ever so slightly mountainous. The meat was perfection, and everything else followed closely behind. I went for a half of baby back ribs with slaw and corn bread with a side of deep fried pickles. I’ve never had corn bread before, so why has no one told me it’s amazing?? The cutest little loaf of cakey sweet bread dotted with corn kernels. 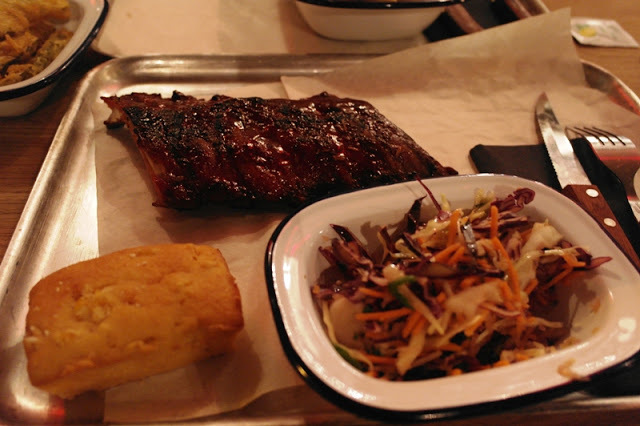 Although the slaw was a dry one you thank the heavens for it, the lime and coriander zing is the perfect cleaner after the main show….the ribs. My god, the ribs. If these are on the “sold out” board, turn right back around and walk out the door. You NEED these in your life. I’m a big fan of ribs. P not so much, he thinks the faffing and messiness isn’t worth the payout of meat you get. But me, I kinda like getting sauce on my nose. They are sensational. Predictably me and P ordered a pudding each, predictably it nearly killed us. 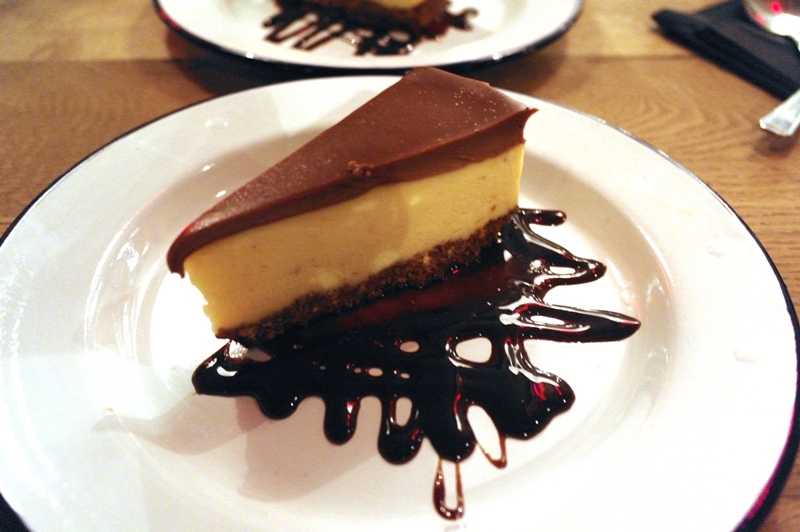 We both had the Chocolate Peanut Butter Cheesecake. A huge stonking chunk of cake so rich and dense, I promise you that you only need 1 slice between 2 no matter what you think. I’ve seen a few reports that people have mentioned some teething problems about staff, sure it wasn’t seamless (occasionally they were hard to get the attention of and didn’t ask if we wanted to pay for a tip on card, queue mad scrabble for loose change) but it’s only been open a few weeks and this place isn’t silver service. You’re probably not going to come here for an ‘occasion’, mostly likely with friends or your OH (ballsy for a first date). The bill came in at a reasonable £50ish for 2 drinks each and a near fatal amount of food. But death by Red’s wouldn’t be a bad way to go ya know.